Till all the seas go dry, my Dear, And the rocks melt with the sun; I will love thee still, my Dear, When the sands of life shall run. Let this old boat show your everlasting love in a tranquil deserted island. 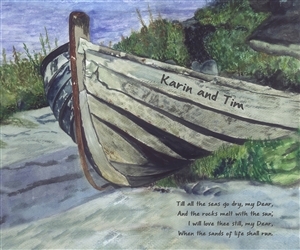 Reveal how you feel to that someone special with this personalized watercolor print.